What’s so special about Governor’s Trace? Well, just about everything, we think, but we’ll let you be the judge. We have some of the most spacious B&B rooms in town. Each room measures about 15 X 20 feet, and that’s not even counting the adjoining porches! All of the rooms have a comfortable sitting and a breakfast area, ensuite private baths, and either a king or queen size bed. For allergy sufferers, rest assured we do not have feather beds nor feather pillows. 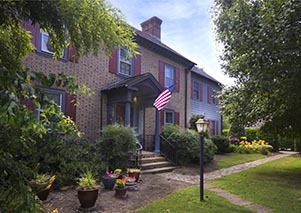 Location, location, location---park your car behind the B&B & leave it; the historic area is just a 30 second walk away…now that’s special! 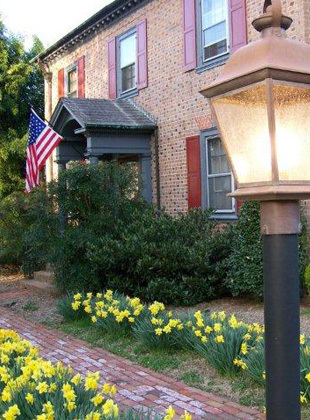 Full candlelit breakfast served in the privacy of your room every morning and no extra charge ever, or it can also be served on your private screened-in porch, weather permitting, and your choice of two times for breakfast. Common area with wood burning fireplace, library and games. Iron, ironing boards, and hair dryers available. Bath soaps & shampoo packaged especially for Governor’s Trace.